John Pierpont (“Jack") Morgan, Jr., 1867-1943. American financier and philanthropist. 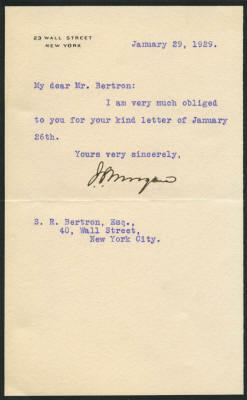 Typed letter signed, J. P. Morgan, on black-bordered personal mourning stationery, one page, 5" x 8", with integral leaf, 23 Wall Street, New York, [New York], January 29, 1929. This is a cordial note in which Morgan thanks fellow Wall Street financier S. R. Bertron for his letter: “I am very much obliged to you for your kind letter of January 26th." Samuel Reading Bertron (1865-1938) was president of the New York international banking firm Bertron, Griscom & Company. The address of 23 Wall Street on this letter is particularly desirable, since that building, located at the southeast corner of Wall Street and Broad Street in the heart of New York's financial district, was for years the home of the powerful J. P. Morgan & Co. bank, later the Morgan Guaranty Trust Company, and sits directly across the street from the New York Stock Exchange. The son of financial giant John Pierpont Morgan, Jack Morgan became president of J. P. Morgan & Company upon his father’s death. He made the firm the sole purchasing agent for more than $3 billion worth of arms and munitions for the British and French in World War I and organized a consortium of some 2,200 banks to underwrite more than $500,000,000 in loans for the Allies. After the war, he was instrumental in the conferences on German war reparations. Morgan created the J. Pierpont Morgan Library, now the Morgan Library and Museum, in New York City to honor his father and donated his London home to the United States government to use as its embassy. His philanthropies also included the Red Cross and the Episcopal Church. Morgan has signed boldly in black fountain pen. 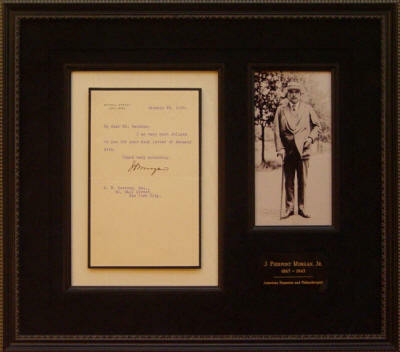 There is slight bleeding to the "a" in the signature, and the letter has one typical horizontal mailing fold, but overall the piece is in very fine condition. It is richly triple matted in black suede and cream moiré along with a portrait of Morgan, inlaid black wood fillet, and an engraved identification plate, and it is framed in a black wood frame.